Each year, as the heat of summer descends upon Europe, tourists flock to the Greek isles in search of sun and languid siestas. With its pristine coasts, mountaintop villages and quintessential seaside charms, the European hotspot is a well-traversed destination. Beyond the travel guides and endless blog posts, there might be a few lesser-known islands which deserve their moment beneath the world travelers’ spotlight. 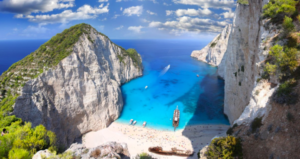 Here is our guide to the hidden gems of the Greek isles. 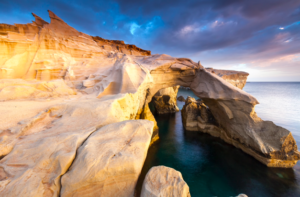 Arriving on the coast of Milos is akin to stepping beyond the pages of a luxury travel magazine. The luminous little island is home to some of the most glorious beaches in the Aegean. The volcanic islet is still largely unfamiliar to tourists but is hailed as the next Santorini. The surrounding coast is spotted with thermal hot springs and patches of secluded beach. 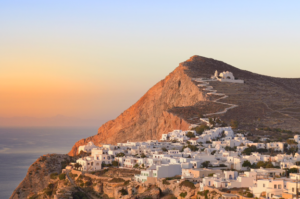 Only an hour’s boat ride away from Santorini, Folegandros has all the Grecian charm and natural beauty of its more prominent counterparts without the exorbitant pricing and bustling crowds. 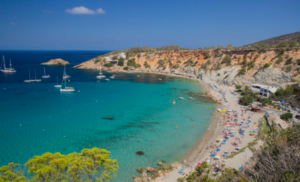 Take in the breathtaking mountainous sights, lay on an expansive stretch of beach and spend your evening’s drinking wine and eating fresh seafood at one of the local tavernas. Far from the hoards of tourists, relatively inaccessible, lies the secluded village of Stoupa. The destination offers unique respite from the rush of the better-known Grecian islands. Steeped in ancient history and folklore, the town is a seaside oasis with its turquoise bays and mountain tops. For something different and anachronistic in its simplicity and beauty, be sure to make this wild and remote village a part of your great Greek escape. The island of Andros remains as one of the stand-alone golden offerings of the Cyclades. The coast is a myriad of color, vivid flora and valleys carved by ancient streams. 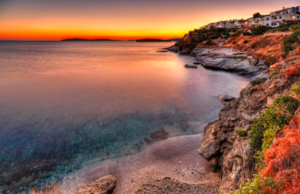 The spot is relatively untouched by tourism but is a true undiscovered pearl amongst the Grecian isles. The local Goulandric Museum of Contemporary Art offers its visitors the most beautiful selection of Greek paintings beyond the country’s bigger cities. This remote Ionian island is something out of a dream-like story book. With a population of just over 3000 and a history immersed in ancient myth, this is a destination for those seeking solitude held within a lesser-known and unpretentiously beautiful landscape. The local square is a lesson in the Grecian way of life; old men playing backgammon and local residents drinking coffee beneath the soft Meditteranean sun. For respite and rejuvenation, book a ticket.